Active Military Personnel: States with more soldiers per capita means states with more people who are physically fit, trained to fight, and have access to weapons. Military Veterans: Percentage of veterans per capita is a solid way of measuring fighting experience. Physically Active: States with residents who rarely get out of their Laz-E-Boy will not escape the zombie menace=. People with Guns: Shooting a zombie in the head is really the best way to defeat a zombie, and to do that you need a gun. Obesity: The obesity epidemic will yield to the zombie epidemic because the obese will struggle with running away from zombies. It’s really very simple. 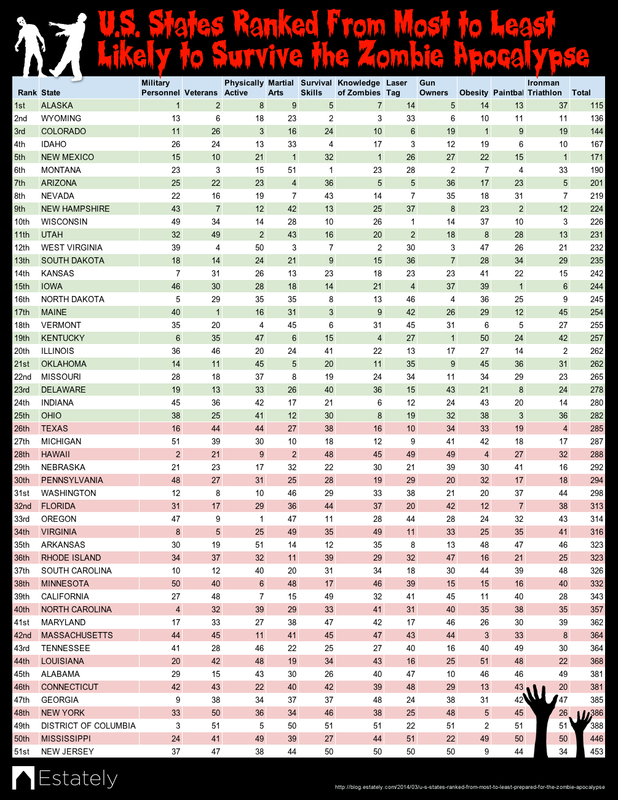 Below is a complete ranking of the 50 states based on zombie apocalypse preparedness. Those at the top are the most likely to survive and those at the bottom are the least likely to. Scores are per capital rankings for each category. Delaware is an island of survivors in the zombie-strewn hellscape that will be the Mid-Atlantic. Florida, where the zombie apocalypse (like all serious problems) will no doubt begin, is oddly not in 51st place. Wisconsin can now make fun of Minnesota and Michigan about something other than the Green Bay Packers standing in the NFC North. New Jersey and Mississippi routinely end up on the bottom of lists. All lists. Rural states offer favorable survivability. 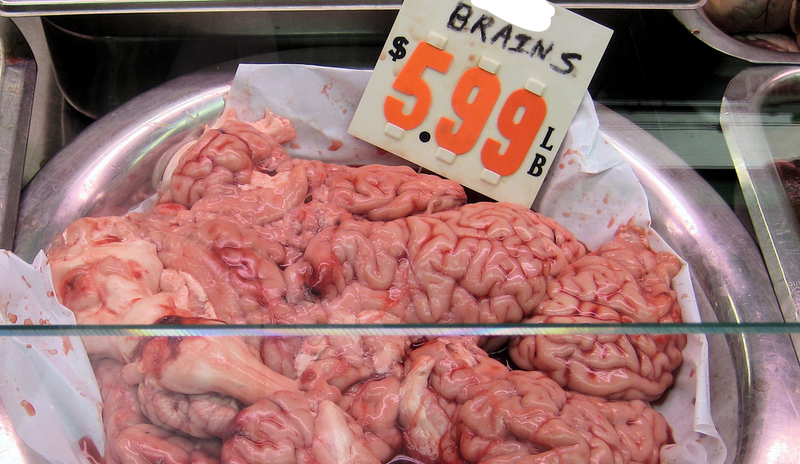 The West Coast and the South will eventually agree on something—the delicious appeal of brains. In a state where residents run from bears and moose, they will not be scared of slow-moving corpses. Alaska is packed with military personnel and veterans, and they’re only a fraction of the well-armed Alaskans prepared to shoot zombies from a moving snowmobile. 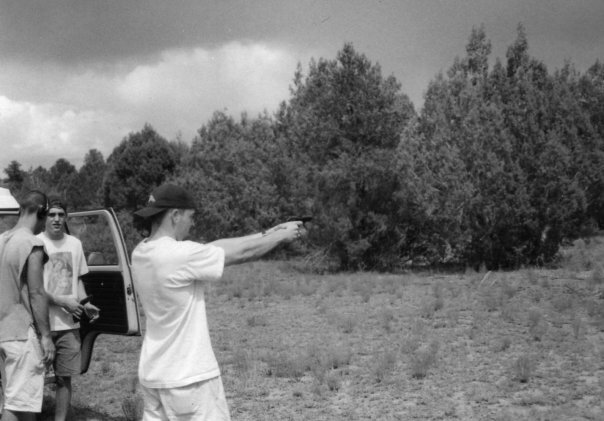 No other state has a shared love of zombie movies and guns like Wyoming. While New Yorkers are having their brains eaten in cafes and elevators, the fine people of Wyoming will be sitting on the front porch with a shotgun enjoying a prolonged zombie hunting season. Coloradans are well known to be among the most physically fit in the country so when zombies start crawling out of their graves, most of the state’s residents will be miles away, easily jogging up a 10,000-foot mountain. If a horde of zombies stumbles into Lewiston, Idaho they’re going to have their hands full. Idahoans are physically active, heavily armed, and are hard to catch because they’re oddly really into parkour. This state knows its zombie facts (from movies and TV shows), but it’s also full of triathletes and martial enthusiasts. Not only can residents escape from zombies by running, swimming, or biking, but they can also turn around and dole out some beat downs like the ninja assassins they are. The state’s residents previously prepared to face the zombie apocalypse, but that was because pranksters hacked into a TV station’s EAS and broadcasted a message that the zombie apocalypse had begun. Had that not been a test, those zombies would have experienced the full wrath of Montana’s arsenal because that state is heavily armed. Home to both the Department of Zombie Defense and the Arizona Zombie Defense Force. The state of Arizona trains for the zombie apocalypse with zombie walks, a Zombie Night at an Arizona Diamondbacks game, and much more. Las Vegas is home to the Zombie Apocalypse Store, so it’ll be easy to buy supplies to fend off the walking dead. Cities around the state are already prepping with zombie pub crawls, a state run zombie prevention site, and more. New Yorkers fleeing a zombie apocalypse will drive up real estate prices when the move to the Granite State, the most prepared in the Northeast. Should the zombies enter an office building in Wisconsin, they’ll face a large number of people prepared to shoot zombies in confined areas because Wisconsin is home to the most laser tag enthusiasts per capita in America. Wisconsin is awesome. 51st—NEW JERSEY If the zombie apocalypse began today, and you live in New Jersey, the odds are 100% that you’ve already been bitten and have become a zombie, unless you took a course from New Jersey’s own Zombie Survival Course. It’s real, and it could definitely save your life… even though they criticized our article. Watch this video. Next PostMissouri “Doomsday Prepper” arrested after terrorizing neighborhood for weeks. Funny how the entire Southeast is labeled zombie land, yet Illinois will defeat the zombies. Total opposite regions when it comes to gun control. Not only that, the entire southeast quadrant of North Carolina is comprised of military and military families. North Carolina is full of ex-New Yorkers and is a melting pot of educated people from around the globe. I’d also say North Carolina is one of the most internet savvy bunch out of the South, it’s not a bunch of rednecks and you realize that once you live there for more than a year. This guy has obviously never been to Nebraska. BULL CRAP ! There are NO zombies ! In 1968 was captured a list of states that would be the hardest to overcome or defeat, a list found on a KGB agent in Germany. The top three states, that would be the hardest to conquer because of military veterans, people with knowledge of weapons, number of hunters familiar with weapons, terrain, camoflage, etc, were; 1: Texas 2. Pennsylvania 3. Michigan – shows how much this “useful idiot” knows. Sorry, I gotta argue with you on DC. The zombies will starve there, as there are no brains in DC. This article is the classic case of a colossal waste of time and energy. Hell, Idaho is still using their search engines to find wtf “parkour” means! Developed in France, ”Parkour” is a training discipline using movement that developed from military obstacle course training. Thank You. I knew, but had to have a jab at my State. Sorry for the double post. In the real world, most citizens of the U.S. are classified as “Zombies” by DHS & U.S. Military planners. Get down around Boise & with most of the people I’ve seen with cell phones glued to their heads or never looking up while texting & driving a vehicle, I can see why thaty classification has merit. Hell, Idaho is still using their search engines to find wtf “parkour” is. I’m calling BS! Most, if not all of your facts are based on Facebook… really, Facebook? Go back to the drawing board, and recheck your facts, minus the Facebook crap. It was pretty good for $hits and giggles though. I think if the zombies do really come, we’re all in a world of hurt. It’s unfortunate that stats were compiled using FB as source. It’s my experience that the peeps most in tune with current events – including zombies – are smart enough to stay off of flippin’ FB. So, this data is woefully incomplete. Colo? any state that legalizes drugs is already a zombie constituency. Family in Colo speak of a lot of folks stoned and dazed and very debilitated since its legalization of pot. Their days are limited. Plus it is the site of Denver Intl Airport and the HQ of the NWO in USA.